Ilonka Karasz (American, b. Hungary, 1896–1981) is an important yet overlooked figure in 20th-century design. 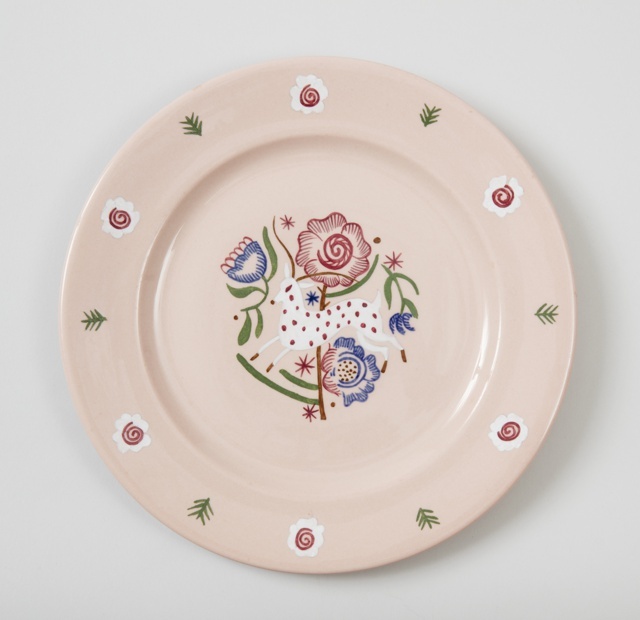 During her long and prolific career, she worked in a wide variety of media, producing designs for wallcoverings, textiles, carpets, lighting, ceramics, metalwork, toys, and furniture. She is perhaps most well known for her popular cover illustrations for the New Yorker magazine. Through her ambitious creative output, Karasz helped popularize a modern aesthetic in the United States. 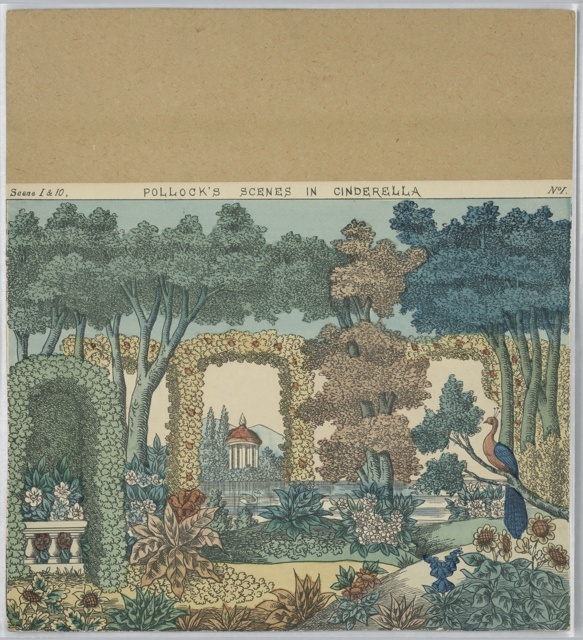 In addition to highlighting the depth and breadth of Karasz’s creativity, this exhibition presents the museum’s recent acquisition of exquisite Karasz drawings and related wallpapers from the 1940s. A native of Hungary, Karasz studied at the Royal School of Arts and Crafts in Budapest before arriving in New York in 1913 and immersing herself in the city’s avant-garde artistic community. 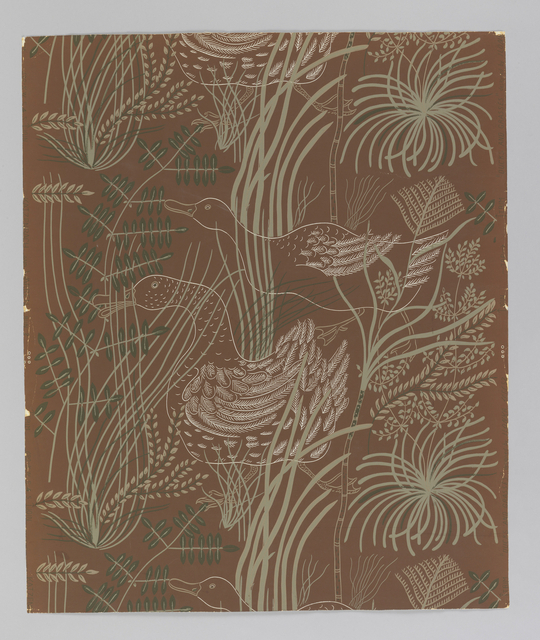 Her prize-winning textile designs for the “Designed in America” campaign, sponsored by Women’s Wear Daily, propelled her career forward in the early 1920s. 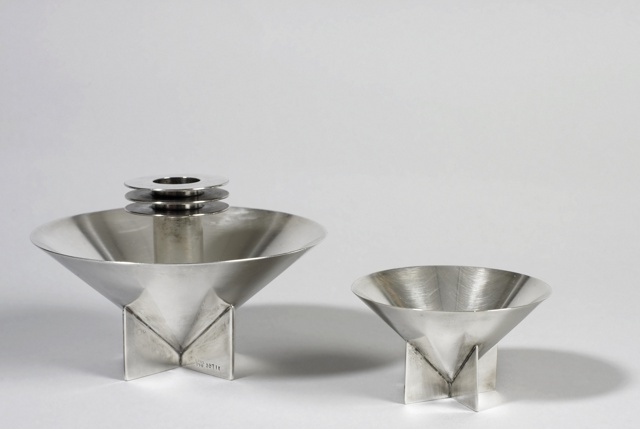 Turning to industrial design, Karasz created furnishings and metalwork for the high-profile exhibitions of American Designers’ Gallery in 1928 and 1929. 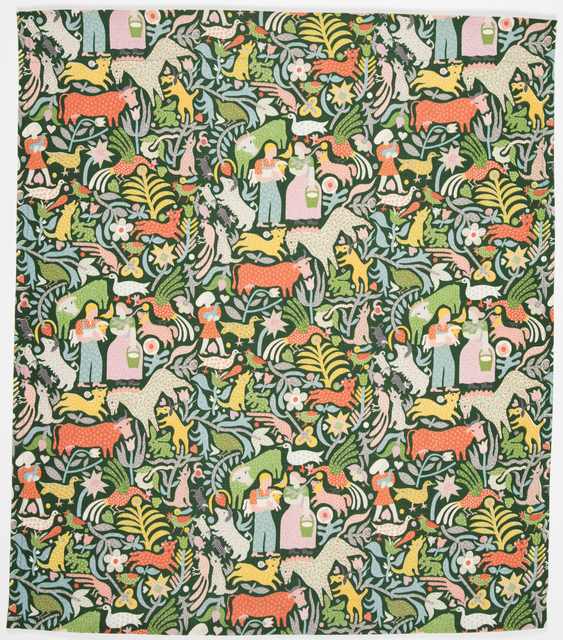 She collaborated with notable designers such as Donald Deskey (American, 1894–1989), who frequently employed her textiles in his designs for interiors. 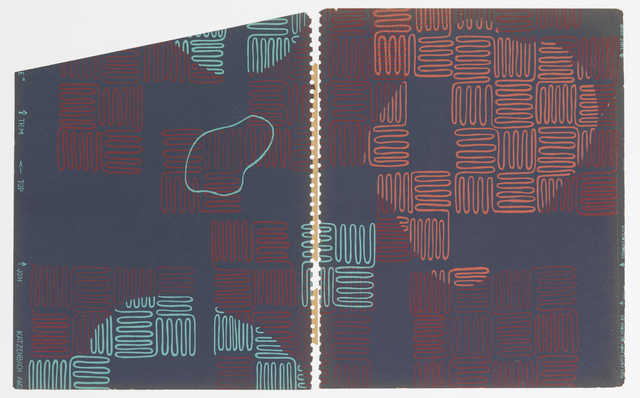 From the 1940s–1960s, her wallpaper designs for the firm Katzenbach and Warren brought her national exposure, as she produced contemporary designs that deliberately called attention to the two-dimensional aspects of wallcoverings and referenced Asian art and Islamic architecture. 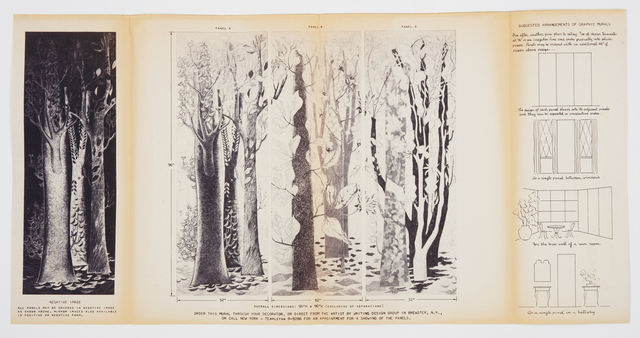 Her scenic papers and graphic murals were printed using novel techniques that preserved the expressivity of her drawings. 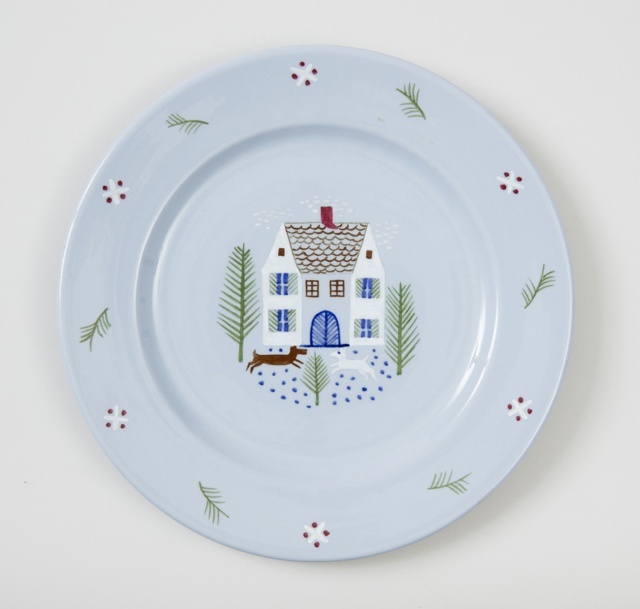 Into the early 1970s, she continued illustrating covers for books and magazines, many of which portrayed city scenes and life around her home in suburban Brewster, New York. Ilonka Karasz designed 186 covers for the New Yorker, many of which are distinguished by elevated, angled views of New York street scenes. 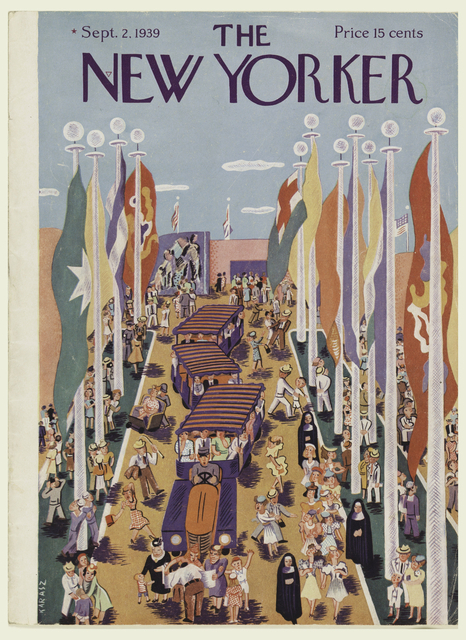 This playful illustration depicts the Avenue of Patriots at the 1939 New York World’s Fair and highlights the fair’s special transportation system and bustling crowds. Karasz’s designs for the magazine showed New York subjects in a modern European style, creating a visual art that was distinctly American. 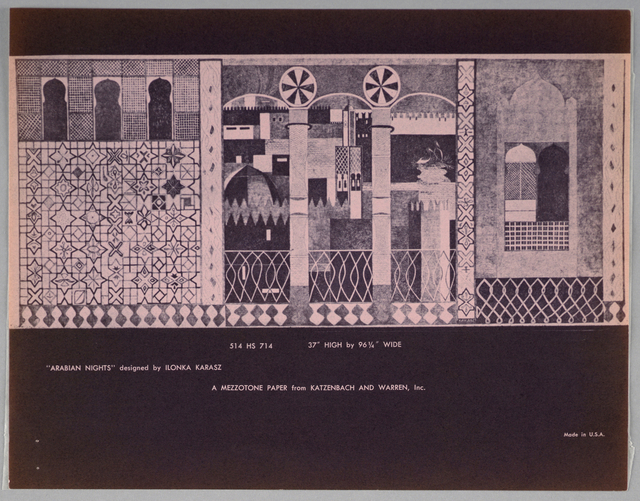 This design for a frieze or mural decoration was never produced and is being shown here for the first time. The view captures New York City’s Lower East Side with the fish market in the background and Staten Island Ferry in the distance. The appearance of the limousine in both the left and right sides indicate the design was meant to repeat. This landscape view has a greater sense of depth than many of Karasz’s designs, and uses a selection of bright colors. This is one of only a few of Karasz’s murals printed in color. The mural shows a romantic vision of rural America bustling with activity, including a family picnicking, farmers working the fields, and one man boating and another fishing in the lake. 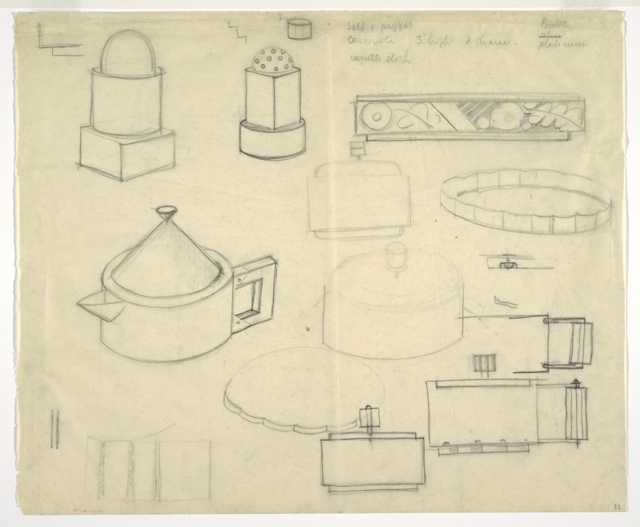 This drawing documents Karasz’s exploration of early modern forms in her initial concepts for electroplated nickel silver tableware. 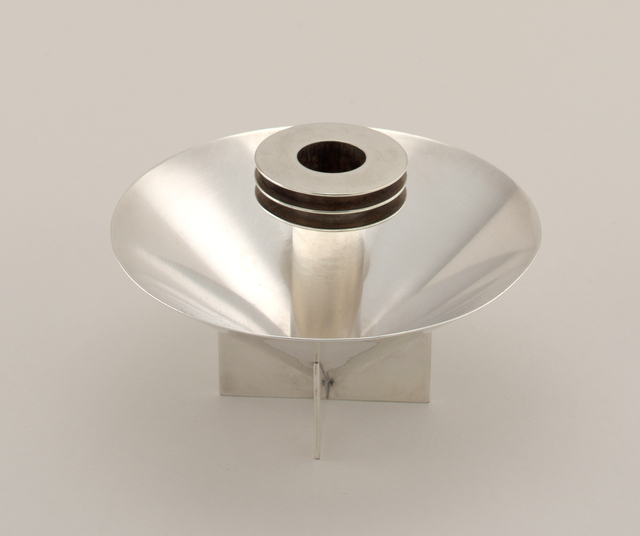 An array of rounded and conical shapes, Karasz’s designs are likely inspired by the metalwork of Bauhaus designer Marianne Brandt. 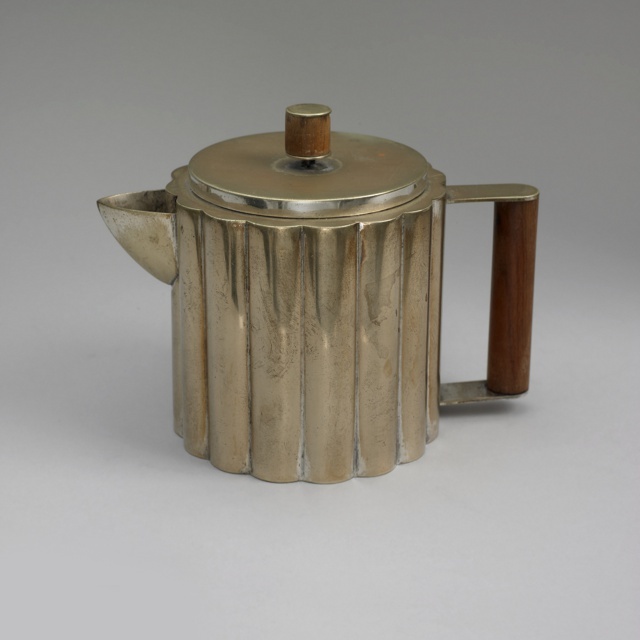 Her designs for teapots similarly incorporate ebony in the handle and lid. Manufactured by Design Group Inc. These four mural miniatures show a selection of the twelve color combinations of ink and paper in which these murals were available. This image of a farmer and his wife first appeared on the August 19, 1944, issue of the New Yorker, one of 186 covers Karasz created for the magazine. 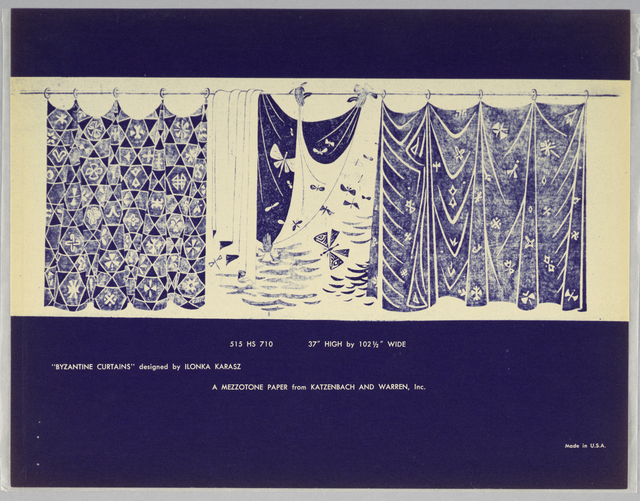 Nearly ten years later, she adapted the design into a repeating print for affordable cotton fabrics produced by Associated American Artists. 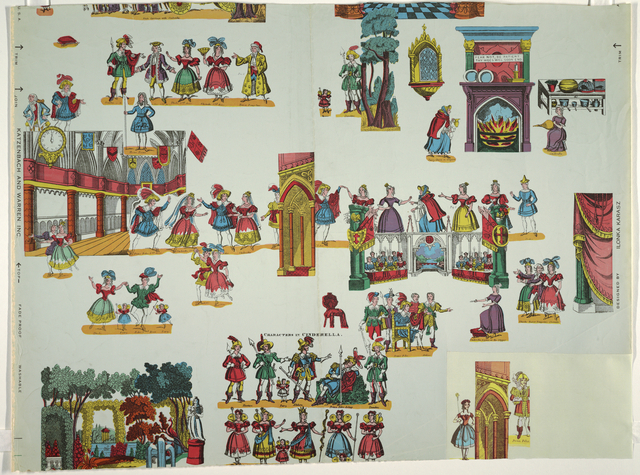 Karasz’s drawings for the wallpaper mural Serenade demonstrate her exquisite draftsmanship. 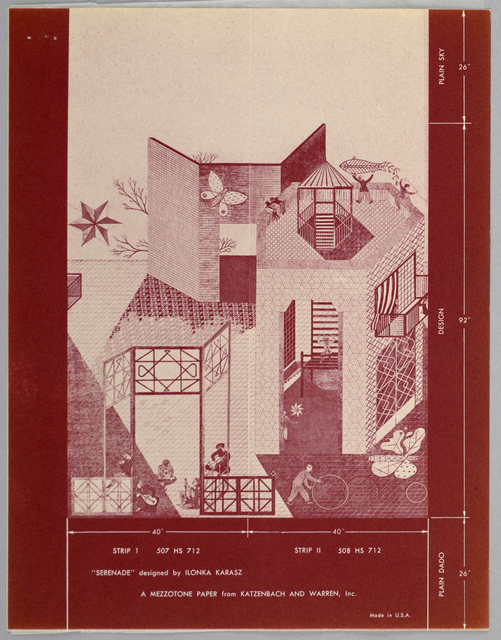 Drawn in graphite and pen and ink on a one-to-one scale, the courtyard fantasy presents an array of pavements, gates, trellises, balconies, and roofs. The mural’s geometric textures and narrative details at once evoke a Persian miniature and contemporary abstract painting. 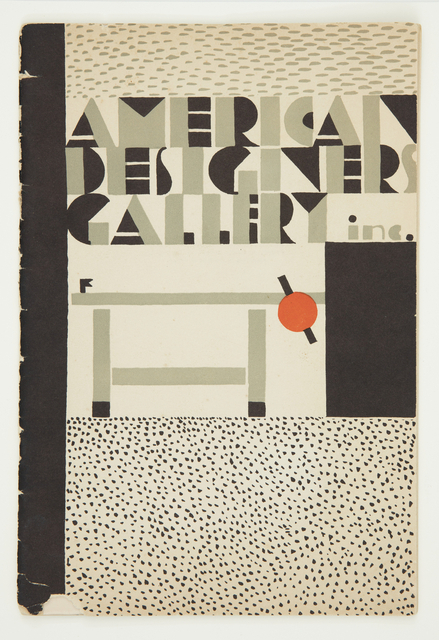 The American Designers’ Gallery was established in 1928 to showcase the work of fifteen prominent American artists and designers with the goal of introducing contemporary art and design in America. 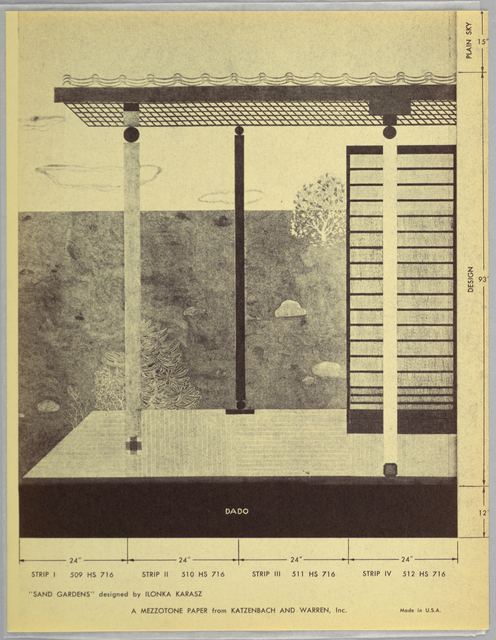 Karasz was one of fifteen founding members and contributed designs for a model office and a nursery, as well as designing the catalog cover.